IMG-NA, LLC (IMG) is an Engineering firm focused on advanced Robotic & Automation applications. applications. 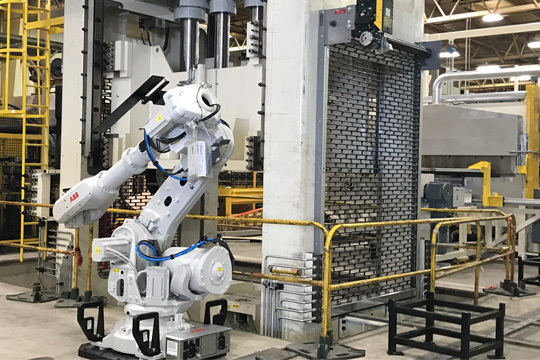 We provide turn-key Press Integration services as well as Robotic material handling solutions such as bin-picking, palletizing and de-stacking utilizing the latest in vision technology. Our team consists of seasoned engineers and project managers with extensive experience in delivering full turn- key solutions from concept to implementation including consulting, plant startup, training and production support. Our experience extends into hot forming sheet and tubular Steel, Aluminum and Carbon-fiber/composite material. VISION To provide solutions that exceed the expectations of our partners. MISSION STATEMENT To build and grow long term partnerships with our clients based on mutual goal of approaching manufacturing challenges with innovative and practical solutions. CORE VALUES Doing the right thing for our employees and partners. Technical innovation and growth. With a team of seasoned engineers and project managers specializing in Robotic and Automation applications. IMG is an engineering firm focused on delivering full turn-key solutions for their clients unique production processes.